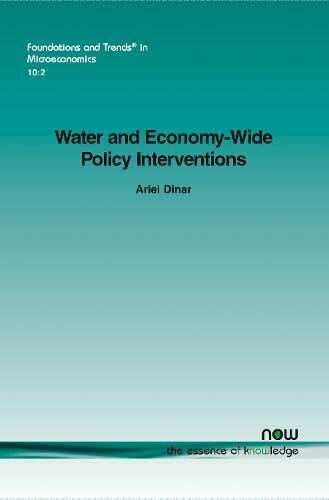 Water and Economy-Wide Policy Interventions considers policy interventions aimed at improving water allocation decisions and assessing the impact on regions and sectors by including both macro and micro considerations in a unified analytical framework. The monograph draws upon a recently completed set of country based case studies on water management policy interventions in Morocco, South Africa, Turkey and Mexico, all using a similar macro-micro CGE framework. The country studies allow, for the first time, a comparison of a variety of policy interventions across various economic, institutional and physical situations, and a generalization to situations and conditions in other countries. The results of the analyses of the macro-micro linkage approach that was applied to Morocco, Mexico, South Africa, and Turkey are presented and contrasted so that the tradeoffs between different social allocation preferences are clearly identified in terms of their impact on sectoral productivity and on welfare distribution, using economy-wide performance indicators. The authors conclude by identifying areas in need for more research - such as climate change, globalization, food crisis, migration, distributional effects - and provide a proposed framework for their inclusion in such analysis. ARIEL DINAR is a Water Resource Economist with the World Bank. He has published in the area including "Water Quanity/Quality Management and COnflict Resoulution" (Praeger, 1995).